The church was built over two years, completed and opening in 1898, and replaced an earlier church built in 1842. It has held a strong ecumenical link with the nearby Roehampton Methodist Church in the form of the “Roehampton Ecumenical Parish” for over thirty years. The 230-foot tall spire of the church is a local landmark and a well-known feature of Roehampton. The church is large, and the height of the building gives the impression to one inside that the church is even larger than it actually is. The inside is softly lit, but not dim, creating a calming atmosphere. The interior is well-decorated, with stained-glass windows depicting saints lining the walls, and mosaics of the Annunciation and Nativity at the back. Above the ornate altar are two mosaics, one of the Crucifixion and another of the Last Supper. These are beneath a stained glass window, and the whole sanctuary area is separated from the nave by two tall thin stone pillars. Large pillars also line the aisles either side of the nave. Near the front is a large marble pulpit, in front of which were lots of items of tinned and packaged food, presumably from a recent harvest festival. A large font is situated in a richly decorated baptisty in a back corner of the church. The service was led by a male vicar dressed in green, gold and red vestments, who wore his hand-held microphone in a manner that reminded me somewhat of a pectoral cross. He spoke with me afterwards and I found him to be very friendly. The minister of the Methodist congregation that this church has close ties with was there at the start of the service and gave the opening notices before having to leave for his own church, and another vicar in white vestments with a green stole gave the sermon and gospel reading. A choir of nine people in white robes spent most of the service in the sanctuary, coming out to take part in the processions, and a man from the congregation gave the Old Testament and Epistle readings. The congregation numbered somewhere between sixty and seventy, although the lady sitting next to me told me that most Sundays it was more like forty. The Mayor of Wandsworth and the MP for Putney were both in attendance due to today being United Nations Sunday, a day celebrated by some churches on the Sunday closest to 24 October (the UN foundation date) in support of the objectives of the UN in attempting to bring about worldwide peace and co-operation. The majority of the congregation would have been in their forties or older; I only saw five people who I would say were younger than thirty. There was a roughly equal proportion of male to female, and just under a dozen people of an ethnic minority. 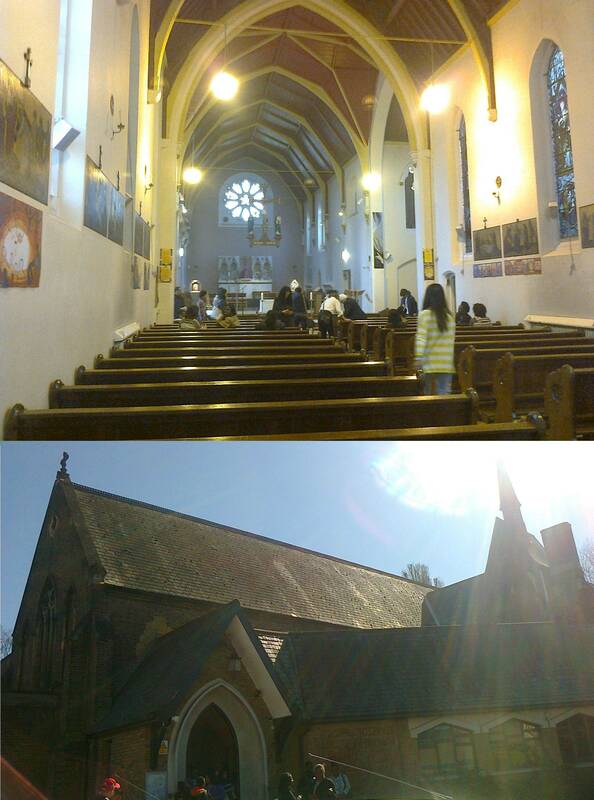 The service I attended was the weekly 10am parish eucharist. As I entered I was given an order of service, a booklet with the Bible readings, and a Hymns and Psalms hymn book. The service began with an announcement from the visiting Methodist minister concerning a church away-weekend next year, and we then sung the first hymn as the vicar and choir processed around the church with a large gold cross. Prayers were said, including prayers of confession and the Gloria, after which the Old Testament and Epistle readings were given by a member of the congregation – Leviticus 19:1-2, 15-18 and 1 Thessalonians 2:1-8 – the latter immediately following on from the former. After the second hymn, it was time for the gospel reading. Some of the members of the choir again processed out of the sanctuary, holding candles, and a young boy from the congregation was handed a gospel book and joined them. They then stood in the middle of the nave and the vicar with the green stole gave the reading from the gospel book, Matthew 22:34-46. After this, he gave the sermon from the pulpit, focusing on fixing things when they break and finding ample opportunity to tie this topic in with the Sunday’s theme of the United Nations. After the sermon, the congregation said the Western version of the Nicene Creed, followed by prayers of intercession for the world. We then shared the peace and sung another hymn before eucharistic prayers (including the Lord’s Prayer) were said, followed by most of the congregation going up to the front to recieve communion. Some final notices were then given, and after a blessing the closing hymn was sung, during which the choir processed out of a side-door. I regret to say that I failed to take note of when the service finished, but I can say that it was between one hour and an hour and a half. Tea, coffee, orange squash and biscuits were served at the back of the church after the service. In celebration of a parishioner’s 90th birthday, slices of cake and even some small glasses of wine were also available. Most of the congregation stayed for the refreshments, and several of them – including the presiding vicar – engaged me in conversation before I had to leave. The church was founded in 1869, and the present building was opened in 1881 by the Jesuits, being extended in 1955. It has links with two small convents which are nearby. Upon entering the church, one’s gaze is drawn to a large crucifix hanging from the ceiling, with models of Mary and St. John on either side. This crucifix hangs above the altar, which has a silver cross on top and is flanked by two candles. To the left of the altar is a lectionary, and behind it against the front wall is a high altar, on which is placed the tabernacle for Eucharistic reservation. As I visited on the second Sunday of Lent, the tabernacle was draped in the Lenten colour of purple. To the left of the high altar is an icon of the Holy Family, to its right one of Christ, and above it is a rose window. The side walls of the church have stained glass windows – some of them depicting saints, others of a simpler design featuring a “SJ” for Saint Joseph – beneath which are pictures of the Stations of the Cross. On the wall to the left of the church there were also some paintings of New Testament events such as Pentecost in a very modern style. In a corner at the front of the church was a statue of Christ. There was also a statue of the Virgin Mary and a statue of a male saint (whose identity I couldn’t ascertain) at the back of the church, where there was also a font of holy water and shelves with leaflets. The service was led by a priest in purple vestments, accompanied by a deacon in white and red vestments and a large number of altar-servers, some of whom were dressed in what looked like beige monastic habits. A second priest, in a white cassock with a purple stole, helped serve communion. A choir was situated in an alcove of the church at the front, and a lady from the congregation came up to give some of the readings and prayers. There were roughly 100 people in the congregation, but I was unable to make an exact count. A large proportion (perhaps about two thirds) was made up of ethnic minorities, and there were a large amount of children there as well. The service was very similar in structure to those I attended at the other Roman Catholic churches I have visited, following the Pauline Mass order of service. The service started with the altar servers processing up the main aisle to the altar with a crucifix on a pole, during which a hymn was sung and the priest censed the altar. After prayers of confession, there came a reading, Genesis 12:1-4, followed by Psalm 32 sung with responses, and then a reading of 2 Timothy 1:8-10. The Gospel reading came next, preceded and followed by an anthem; it was Matthew 17:1-9, on the Transfiguration. After the readings came the sermon, reflecting on the Transfiguration and also on the Trinity and the recurring references to mountains throughout scripture. Prayers came after this, followed by notices and a collection. The choir then sung a hymn while the priest prepared the wafer and wine for communion, which was followed by some mostly sung prayers, including “Holy, Holy, Holy” in Latin. The congregation then knelt as the priest lifted up the wafer and the wine in turn while prayers were said asking for them to become the Body and Blood of Christ. After the sharing of the peace, the congregation went to receive communion, which was served both at the front of the church by the priest and at the back by a second priest, who hadn’t before this done anything in the service. After communion, there was a hymn sung with the congregation seated, accompanied by a guitar, as the leftover communion was stored in the tabernacle in the high altar. After more prayers, some more notices were announced. The priest then asked if anybody had a birthday over the coming week, and those who did stood while the congregation sung a blessing to them. The priest then blessed the congregation, and processed to the back of the church with the altar-servers while a hymn was sung to St. Patrick, whose feast day it is tomorrow. There were no refreshments served afterwards. The priest stood at the door, saying goodbye to members of the congregation as they left.